The first day of school is a milestone for every child. However, the preparation for a smooth transition to school and beyond happens from the day they’re born – not just in the year before formal schooling. While there is a focus from families on academic capabilities in children, it actually encompasses a broad range of skills from emotional and social development, physical, critical thinking and problem solving skills. To support children as they prepare for the smooth transition to school, Guardian Early Learning – Queen Street offers a QLD Government approved Kindergarten Program. Oscar constructing his name and Shayne, the Kindergarten educator. Run by Shayne, a Bachelor of Early Childhood Teacher who is registered with the Queensland College of Teachers, this program is based on the approved and regulated Queensland Kindergarten Learning Guidelines. The program, which provides a focus on continuity of learning from early learning to school gives children at the centre a strong foundation as they transition to Prep and ‘big school”. We recently received the following feedback about the program from a family after they attended the enrolment interview for Brisbane Boys College. “George was given a verbal offer immediately after his interview and the Head of Early Years commented on his approximation to school readiness. 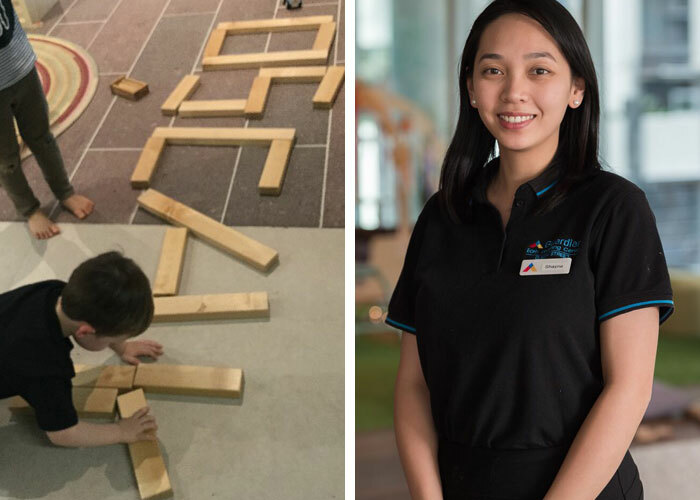 We felt they were happy with his ability to follow instructions, his tidying up of toys used during the interview without being prompted and his general classroom etiquette through exposure to learning environments such as Guardian Early Learning– Queen Street. The Kindergarten group at Queen Street have been fascinated with a marble run set that was donated recently to the centre. 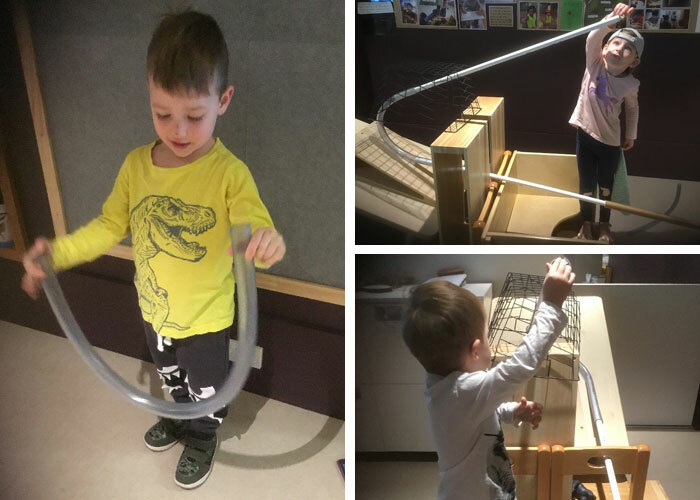 After many explorations with the set, the children set themselves the challenge of building their own huge marble run using materials from the learning space and repurposed materials from their recycling trips to local businesses. Using chairs and large blocks to elevate sections of construction, the building of this took place over a number of days and required trial and error, persistence and collaboration. Decisions here were about design, mechanics, acceleration and energy, and children learnt that modifications are important and are a crucial part of the invention process. Hugh suggested using some pipes. First he tried attaching the pipe to the end of the track but he quickly realised it didn’t work. There was room for creativity too. Oscar thought of bending the hose. It was wonderful to see the children working together, thinking creatively and solving problems. This project supported development in many areas including scientific concepts (gravity, speed, cause and effect), physical skills (constructing and putting together objects) as well as collaboration skills and resilience (to keep going when something fails the first time around). 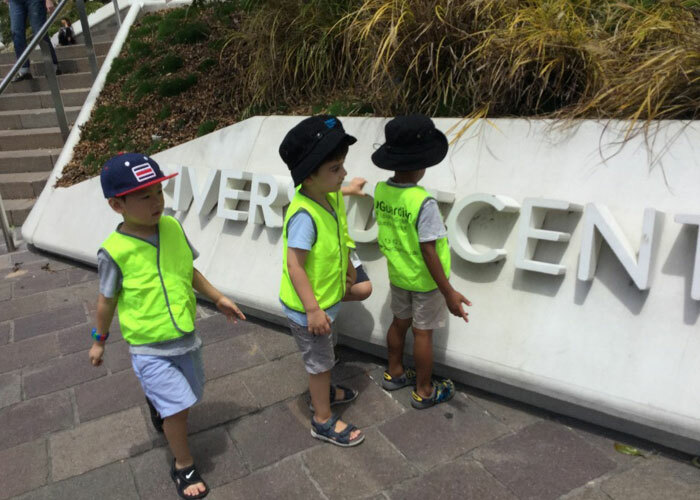 To find out more about Guardian Early Learning – Queen Street’s Kindergarten Program, and to book yourself in for a tour, head here.